Yogurt chicken / Dahi Murgh / Curd chicken gravy is an Authentic North Indian style chicken gravy which is very simple yet delicious dish. 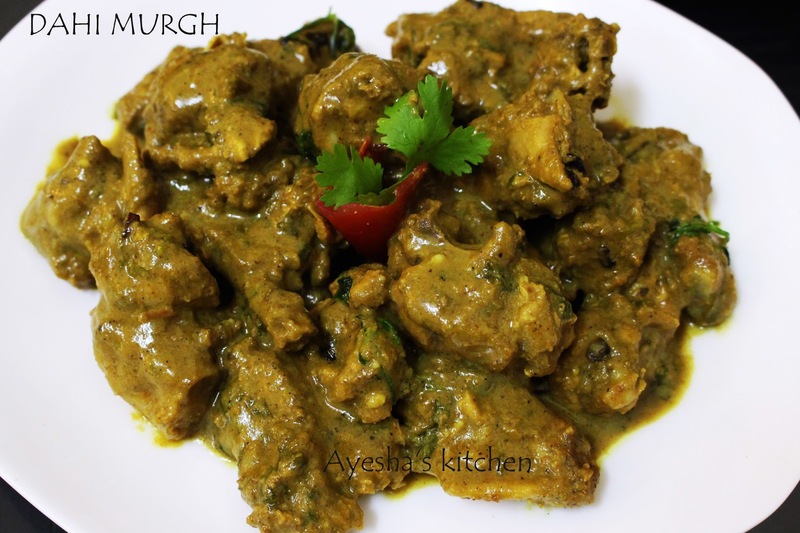 Chicken cooked in yogurt imparts a special taste to the curry. In this recipe no marination is needed. Moreover no onion no tomato no red chili powder. Awww...even i thought, why we are simply using those stuffs as this tastes better. If you want to enjoy the real flavor of Dahi Murgh or yogurt chicken, i recommend not to add chili powder even if u add pepper powder instead. This recipe will definitely makes your meal special and mouth watering. 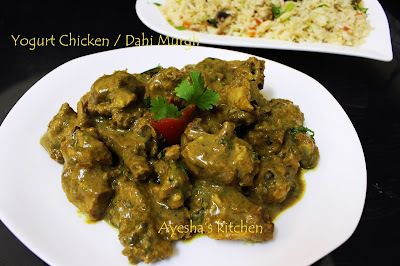 So lets see how to make this Punjabi dish Dahi chicken / Dahi murgh / Yogurt chicken. A must try recipe.. Grind together coriander powder, turmeric powder, pepper powder, fennel seed with some water to a fine thick paste. Set aside. Heat 1 tbsp of butter in a wok. When hot, add the ginger garlic paste and toss in a medium flame until the raw smell disappears . Then add the chicken pieces and toss it well for 1 minute. Now add the thick spice paste along with some salt and mix well. Do not add water as the chicken itself will release water. Let it cook until 80% cooked in a medium flame. Stir occasionally. Close the lid of the wok. When done, add the yogurt along with some chopped coriander and mix well. Cook until chicken becomes tender. This is a less gravy chicken dish. If you need more gravy, u can grind one onion along with the spice powders and add as above said. Finally heat 1 tbsp of butter in another pan and fry small onion chopped until golden and pour it over the prepared gravy. Enjoy with Pulao, fried rice, chappathi, Dosa, Poori..